If there’s one meal I simply cannot skip – it’s my breakfast. Growing up, we always had a hearty breakfast – almost always chappatis either with eggs or jam, or even with left overs from the night before. There was also fruit, oats (a whole other story! ), cheese, sausages, etc on offer. My brothers would end the meal with jam and cream on their chappatis! And when they were in their teens, we lost count of the number of chappatis they polished off in one go…. Now you might not really be interested in what I ate for breakfast, but wouldn’t you love to know what some of the greats ate for theirs? Thomas Edison, Rosa Parks, Jane Austen…..Interesting, right? Sample this from Winston Churchill: Poached egg, toast with jam and butter, cold meats, grapefruit, whisky, cigar ! The Most Important Meals of Their Lives is an e-book that has been launched by Send a Cow, a British charity, as part of its new Break… Fast appeal. The Send A Cow team spent a weeks looks at historical records, talking to experts, inspecting archives and personal correspondence of several famous world figures to find out what they ate. They sourced recipes of breakfasts that were actually eaten or inspired by some of the men and women who continue to inspire us with the lives they lived and their achievements. Send A Cow called in a team of professional chefs and food historians to put together this collection of 18 breakfast recipes. Did you know that Mahatma Gandhi, who spent a great deal of time experimenting with food to find the perfect diet, often ate porridge and cocoa and goat’s milk for breakfast. And to think that the Bard of Avon actually wrote all the wonderful works he did on a breakfast of sops – stale bread and milk! While giving us some new recipes, the book also gives us a peek into the daily lives and routines of some of the world’s most influential people. For example, although Charles Darwin may forever be remembered for the theory of evolution, but he was also an early pioneer of a low-carb approach, and was experimenting with a cayenne pepper diet over a hundred years ago! Today I invite you to download ‘The Most Important Meals Of Their Lives’ here. A good breakfast gives a child the energy to go to school and reach their potential. However, millions of children in Africa don’t have enough to eat. Research* shows that up to one in every three (34%) people in Uganda and almost a third (29%) in Rwanda are gravely undernourished – an estimated 15 million people. Without full stomachs youngsters struggle to focus on their school lessons and are prevented from realising their individual potential. Send a Cow’s Break… Fast appeal aims to raise £500,000 to give children in Africa a better start, and every £1 donated will be doubled by the UK government until 30th June 2014. Support the Break…Fast appeal to provide seeds, tools and livestock so families can grow enough food to feed themselves. There is a suggested a donation of £2.50 to the Break… Fast appeal. A £2.50 donation, when doubled, by the UK Government, is enough to ensure a child can get all the benefits of a nutritious breakfast for an entire month. the Break…Fast Appeal from Send a Cow on Vimeo. So go ahead and download the book, but also spread the word and make a your contribution towards helping the children in Africa enjoy the most important meals of their lives! For more information on the Break… Fast Appeal please visit www.sendacow.org.uk or tweet @Sendacow with the hashtag #BestStart. What a wonderful post! Cake for breakfast.. now that’s my kind of thing! Thoroughly enjoyed this. Thanks Corinne. Thanks for this one Corinne. 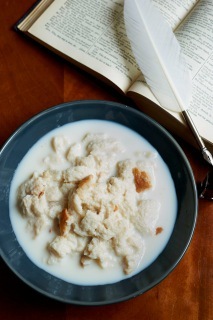 I have this bad habit of skipping breakfast but the ideal one would be coffee with cake/biscuit/Poha/Sheera. The Churchill meal, quite interesting and its a fact I was oblivious of. I guess whisky and cigar were integral parts of all Churchill’s meals! He probably had them between meals as well!! I’ve never missed breakfast. It could be Indian / eggs and toast / oats followed by a cup of coffee. I’m looking forward to your ‘oats story’. Breakfast is the most important meal of the day. These days it has become a fashion to skip breakfast. We have had the same breakfast for close to 40 years –a protein fruit smoothie — fills me up and I rarely am hungry until dinner. That’s truly unique stuff .I must say. Wonder where we get all that interesting stuff from?Breakfasts by famous folk. Darwin on cayenne pepper diet? Shakespear on breadcrombs? But breakfast happens to be the most cherished diet for most people,who are fortunate enough to relish it.Most people are too preoccupied with sprinting to work,and just barely swallow.or gulp their mouthfuls down. Eating a good breakfast was important at our house. I was a reluctant eater so my mom let me eat whatever sounded good as long as I got some protein. I look forward to reading that book. Also, here’s a nice little story. The children at our church raised enough money through offerings to buy a cow for a family in Rwanda through Heifer International. Their program requires the receiving family to breed the animals and give the offspring away. When that particular cow had trouble conceiving, the children prayed and she eventually gave birth to twins! What a lesson in faith! So true that breakfast is the most important meal of the day. 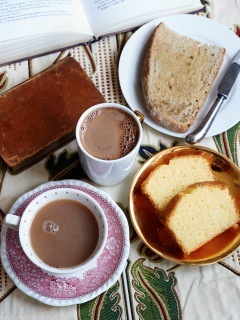 My usual breakfast is a nice cup of chai, a glass of orange juice, some toast with jam and cheese or ham. Some weekends I have some porridge (oats). Will look up the book. Thanks for sharing. I hope and pray that each and everyone on the face of this earth have the stomachful food everyday…. I usually don’t skip breakfast, Corinne and been trying my own experiment for the past few months – eating the same breakfast everyday. Oats and fruits – almost every single morning. I’ve managed to do so on a pretty regular basis and don’t have to think much about this morning meal. And it’s a pretty filling one as well. Just saw the video above and onto the website next. Thanks for sharing it! What a great thing this organization is doing, and what a fun idea for a book! Thank you for sharing this info. 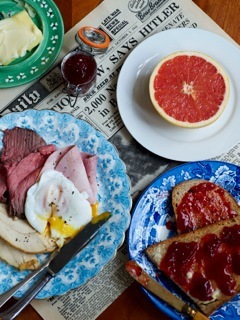 If you ask me which one meal enjoy the most both eating and preparing, it’s definitely ‘breakfast.’ Lovely post Corinne. Made my mouth water. Breakfast is my favorite meal of the day, and I love it when we occasionally have breakfast for dinner. 🙂 Thanks for sharing these interesting facts about famous folks and what they ate. The book and the cause it supports is great indeed! There is abject poverty in some parts of India as well. Kids and adults don’t get a square meal the whole day sometimes let alone a breakfast. I was talking about the coal mining areas of Jharkhand yesterday with some friends, I feel terrible when I am reminded of how talented those people are and still they stay hungry. I apologise for diverting from the issue. Great cause this Breakfast appeal is. My breakfast growing up in a north Indian home was mostly paratha stuffed with seasonal vegetables or broken wheat porridge or black chana curry and plain paratha, dahi paratha etc etc. usually its Indian breakfast with fruit. or toast with peanut butter and jam (yumm) or cereals like honey bunches of Oats , Cheerios, cornflakes. I would love to know the ‘whole other story’ about the oats. Sounds like a fun and informative book… and for a good cause. It’s a lovely book. Do take a look. Licklicious : mango in brine. Breakfast is the most important meal of the day and should be had like a King. Diet watchers too have to aware of this fact.But most children around the world esp. undeveloped and some developing countries do not get to eat breakfast and this affects their physical and mental growth. It sounds delish, Vidya! You know my weakness for mangoes in brine! Mmmm…. I love this post! 😀 Growing up my regular breakfast before school was rice from the night before mixed in buttermilk with “Vadu manga” (tiny mangoes in brine). So funny to think now. I am off to get the book. So glad to read about what Send a Cow is doing! Thanks! I can imagine how you must have enjoyed writing this, Corinne!